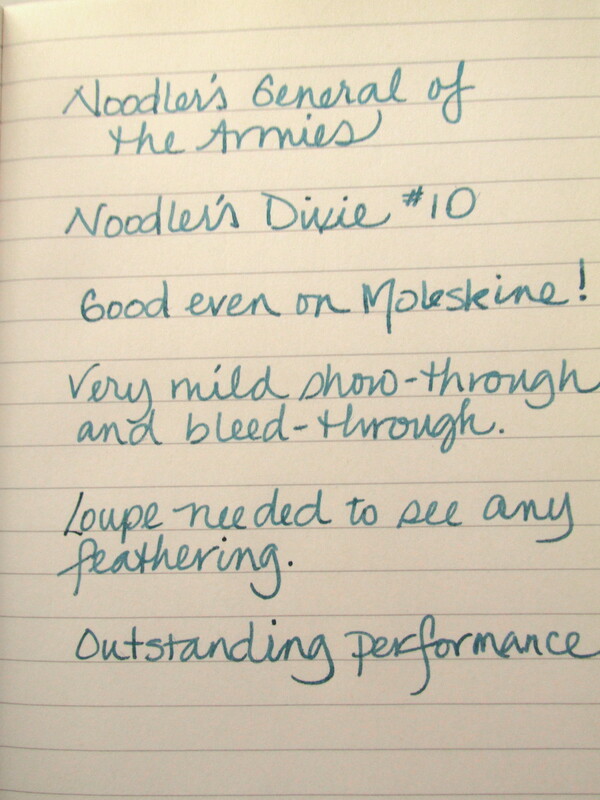 When it comes to bang-for-the-buck fountain pens, Noodler’s has a lot to offer. My new Konrad Ebonite Dixie #10 is no exception. 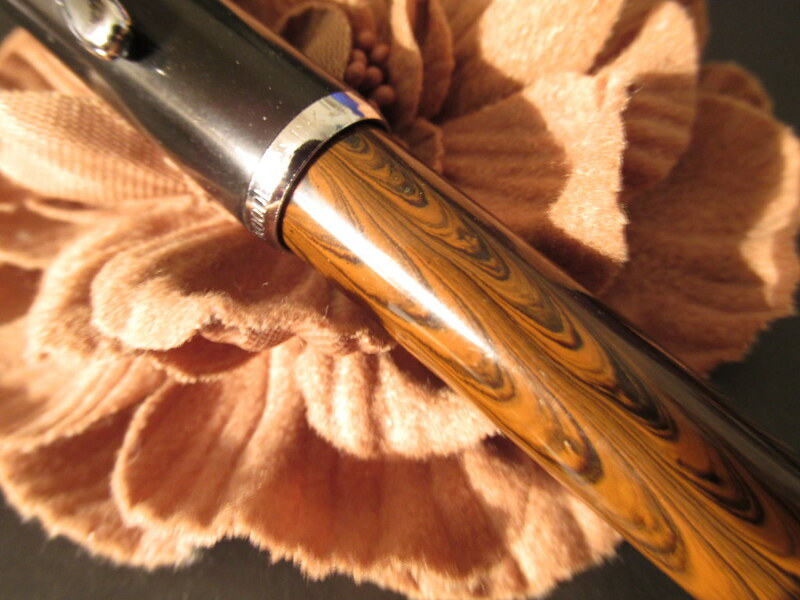 It is a piston filler made of ebonite and biodegradable plastics. 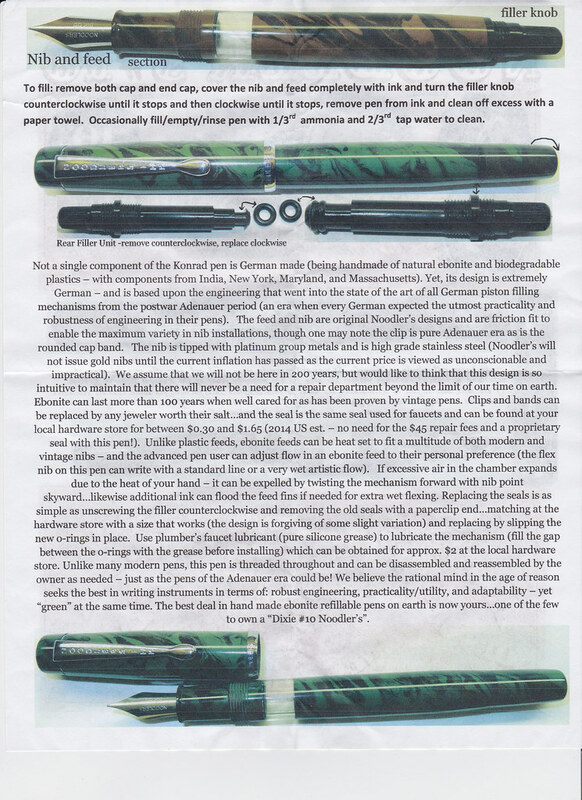 The pen is medium sized, but does not need posting for comfortable balance. That’s a big plus for me since it keeps the weight down and the number of hours I can use it up. 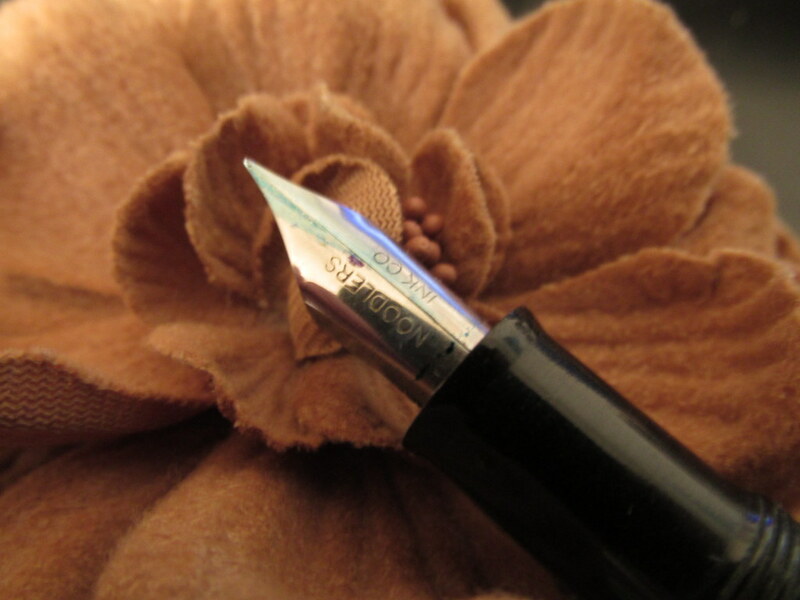 The stainless steel fine-medium nib writes smoothly and with good flow. It has a little give but isn’t flexible or even soft though it is a very comfortable writer. I did rinse it well with lukewarm water prior to its first fill to remove any remnants from the manufacturing process. Note that the pen needed not one bit of tweaking to perform perfectly. That might not hold true for every Noodler’s pen, but none of the half dozen I own has worked any less well. With little effort the nib can be swapped for another Noodler’s like one from the Art Nib Pack. Some modern nibs will fit and even a variety of vintage nibs. 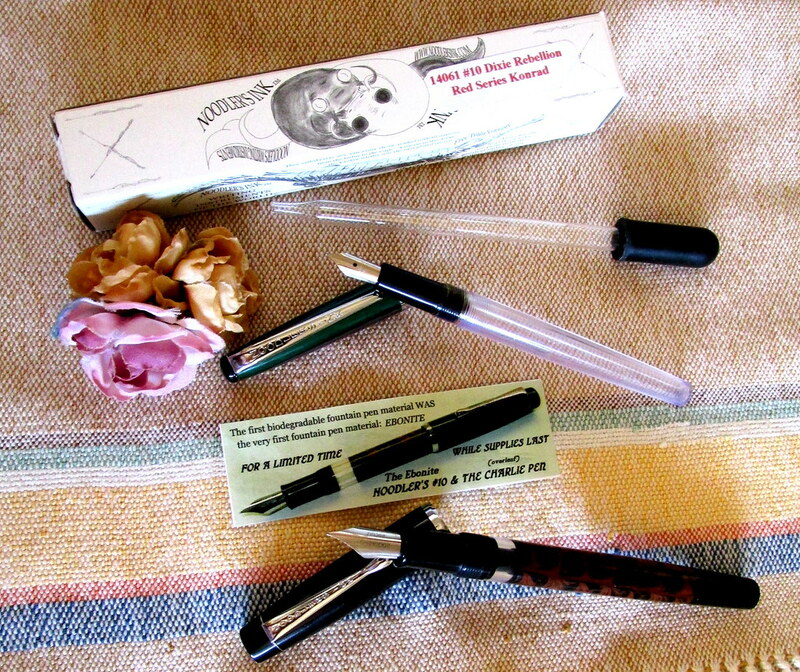 There are extensive instructions included both for nib swapping and long term maintenance. 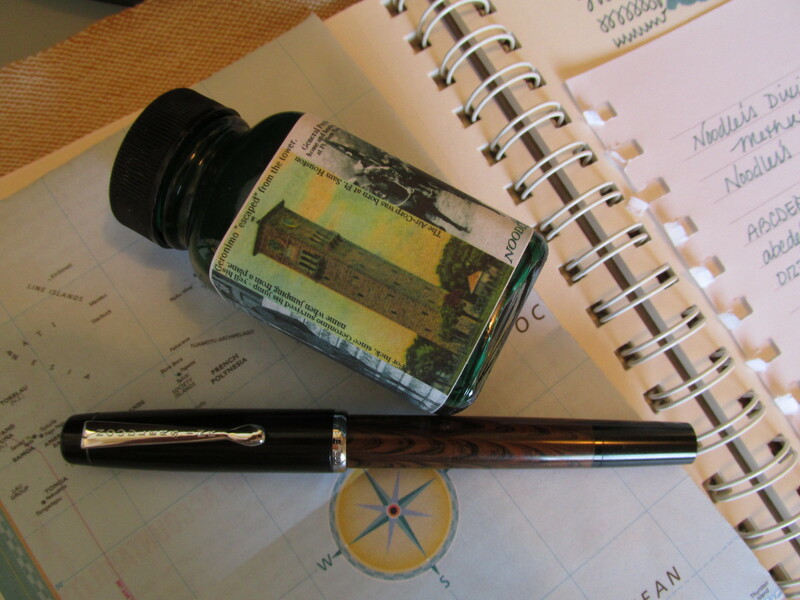 Unlike some pens the inkvue window is large enough to see easily when it is time for a refill. 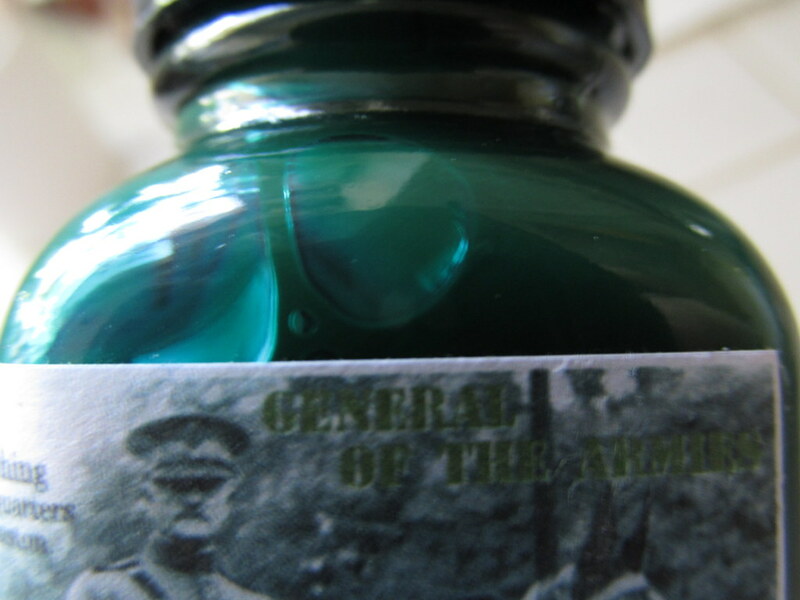 For a quirky twist, my pen is filled with Noodler’s General of the Armies, the green ink that turns blue. The window shows one color while the nib puts down another. It’s good to have a bit of fun while writing. 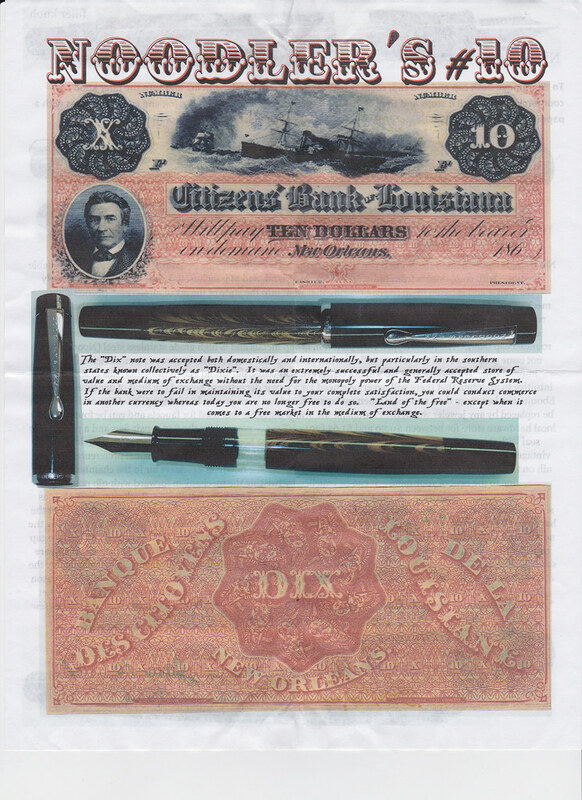 Some users have objected to the odor of Noodler’s pens. It isn’t present with all models and the pen I received has no scent. Yea! The style of the Dixie #10 Methuselah reminds me of a wood paneled library so it’s a bit retro and a good contrast to my mostly black arsenal. 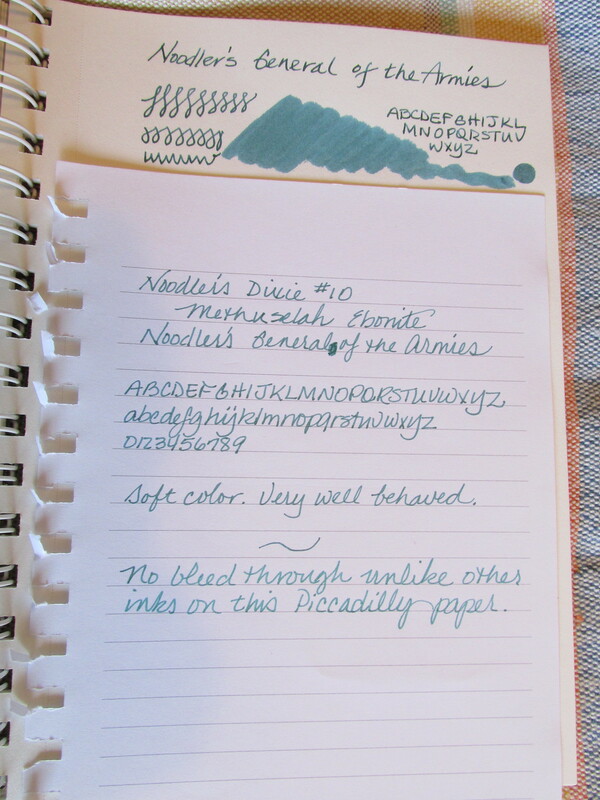 This is one Noodler’s pen that is going to get a lot of use. 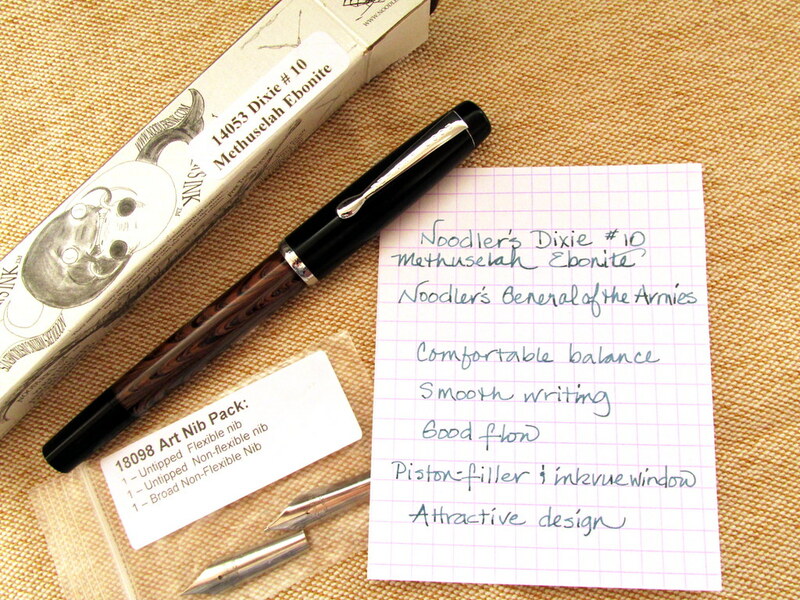 Thank you, Carol and Luxury Brands USA, for sending the Noodler’s pen, nibs and ink. 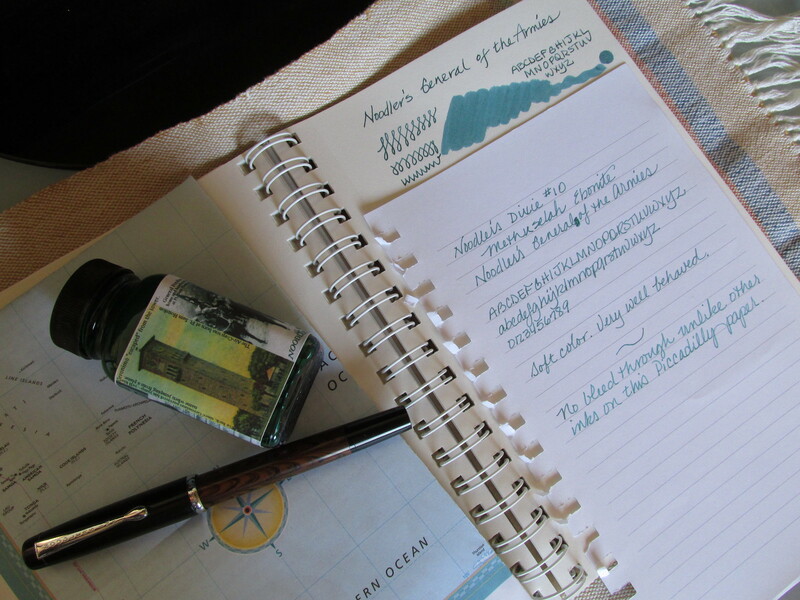 The sturdy pen and all-purpose ink have become my travel companions as well as fixtures on my desk. 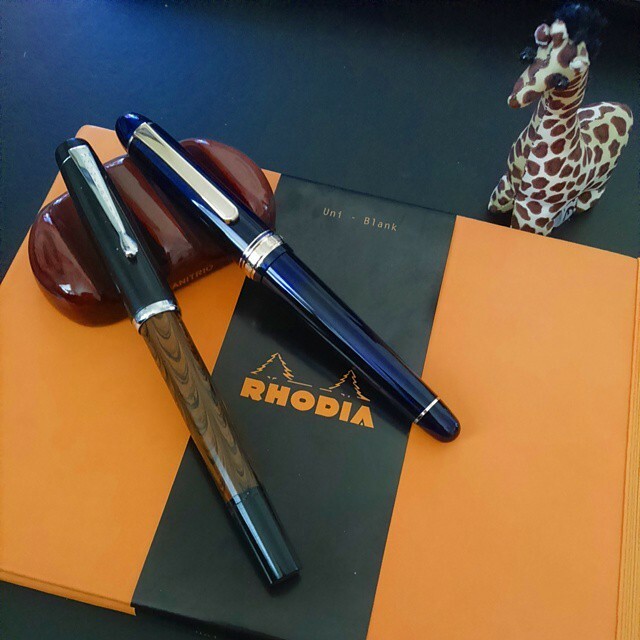 They haven’t bumped aside the Platinums, but it is the pen that goes with me everywhere while the Plats live the soft life at home. Variety is so sweet or is it spicy? Not that it matters since either way is fine with me. 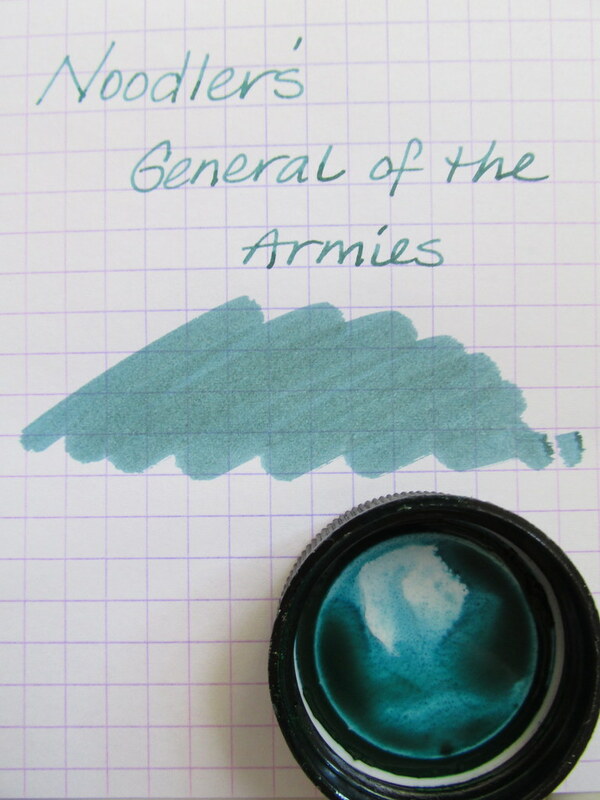 More: Review of Noodler’s General of the Armies.